Stachybotrys chartarum (sometimes referred to as S.atra) has a worldwide distribution and is most commonly isolated from dead plant material in the environment. S. chartarum is strongly cellulolytic and in indoor environments is often isolated from moist building material with a high cellulose content (i.e. drywall paper). It is generally a tertiary invader and can be used as an indication of water damage. Stachybotrys chartarum has a relatively slow growth rate with a hyaline appearance that darkens to a brown/black with time (sporulation). Conidiophores are typically simple, hyaline or pigmented, with clusters of 3-10 obovate or ellipsoidal phialides. Conidia are produced in slimy masses, ellipsoidal, dark and verrucose. While Stachybotrys chartarum can cause allergic reactions in sensitive individuals, no evidence has been produced that S. chartarum can cause infection in humans or animals. Stachybotrys chartarum produces numerous mycotoxins including the trichothecenes roridan E, satratoxins F, G, and H, and verrucarin J. These mycotoxins are not produced by all isolates of S. chartarum, and those isolates that do produce these trichothecenes do not produce them at all times. Mycotoxin production depends on a number of environmental conditions including the substrate on which the isolate is growing, humidity, and temperature. 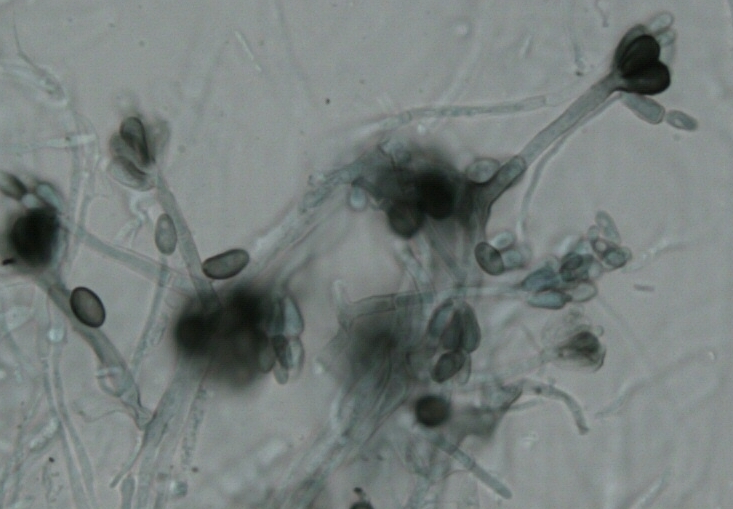 Trichothecenes are present in the spores of S. chartarum and exposure can occur through inhalation, ingestion and/or touch. These mycotoxins can be deleterious to human and animal health and several cases fatal intoxication have been reported in animals that have ingested contaminated feed. Note: Stachybotrys chartarum is often referred to as 'toxic mold' or 'black mold'. Neither of these terms have any scientific meaning. Many fungi are dark (or black) and many produce mycotoxins.